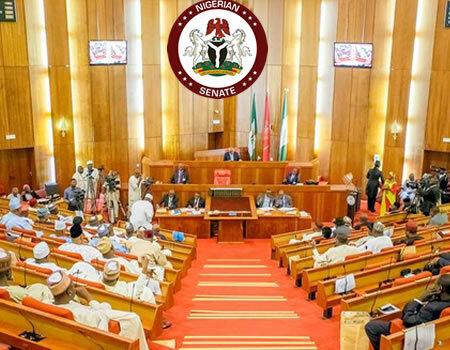 The Senate chamber has been thrown into a rowdy session as lawmakers disagreed over the confirmation of four new members of the Economic and Financial Crimes Commission (EFCC). The members are Ndasule Moses, Lawan Mamman, Galadanci Najib and Adeleke Adebayo Rafiu. President Muhammadu Buhari had in July 2016 written to the Senate, seeking confirmation of the nominees as members of the commission. The chairman of the Committee on Anti-Corruption and Financial Crimes, Chukwuka Utazi, had presented a report of the committee to the lawmakers. He, thereafter, stated that the nominees are fit for the position and recommended that the Senate confirm them. Before the Senate went into the committee of the whole, Victor Umeh (APGA, Anambra), criticised the report, stating that in all the recent appointments into the commission, the South-east had been “marginalised”. He explained that while the acting chairman, Ibrahim Magu, is from the North-east, the recently confirmed Secretary of the Commission, Olanipkekun Olukoyede, is from the South-west and two of the nominees are from the North. While accusing the executive of not playing along with the federal character principle, he asked that the report be stood down until the nomination is reviewed – a suggested that was supported by Eyinnaya Abaribe (PDP, Abia). On his part, the Senate Leader, Ahmed Lawan, urged the Senate to go ahead and consider the recommendations of the committee. Ali Ndume, (APC Borno), thereafter blamed the committee for not noticing the error in the report before recommending confirmation. The chamber was thrown into pandemonium as lawmakers rose from their seats and yelled at each other – rowdiness which lasted for a while. Effort by the Senate President, Bukola Saraki, to calm the angry lawmakers was unsuccessful. This prompted the lawmakers to go into a closed-door session.